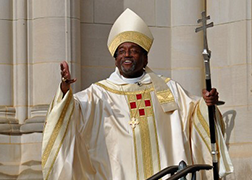 [Episcopal News Service – Houston, Texas] Presiding Bishop Michael Curry preached Nov. 16 during the opening Eucharist for the International Black Clergy Conference. The Eucharist took place at Christ Church Cathedral in downtown Houston. The church, which is the oldest congregation in Houston still worshipping on its original site, was filled for the service with members of the Diocese of Texas. Texas Bishop Andrew Doyle presided. The conference runs until Nov. 19. Previous ENS coverage of the conference is here.